On April 22, 2015, former Mayor Francis Slay signed Executive Order #52 which REQUIRES recycling at all permitted events in the City of St. Louis. Talk with event organizers about incorporating recycling into your event plan. 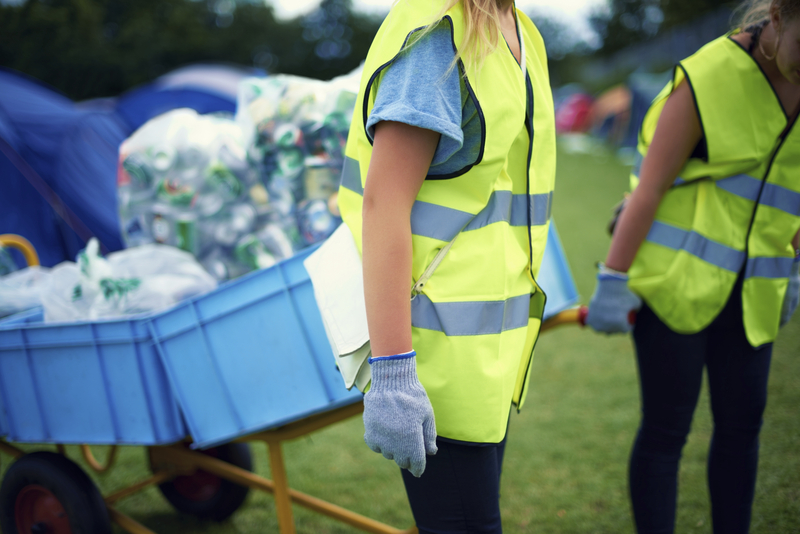 Appoint someone as the leader of the recycling efforts for your event. Contact the City of St. Louis Office of Special Events to start the permit process. Often the company who picks up the trash offers recycling pickup services as well. Contact your trash hauler to see if they have recycling services available. If you need help finding a recycling hauler, review our Recycling for Businesses, Institutions, and Nonprofits page. Ask your hauler what items they accept for recycling. Consider what types of waste will be generated at your event and then determine ways to ensure it can be recycled. Figure out who will provide recycling bins. Ask your waste hauler if they loan or rent out bins you can use. Or, contact Recycling On The Go by St. Louis Earth Day. Be sure bins are labeled as “Recycle” or “Recycling Only” and have clear signage explaining what can be recycled. Plan to place at least one recycling bin next to every trash can. Get extra recycling bins and place them behind food and beverage vendors for “behind the scenes” recycling. Identify who will be responsible for emptying the recycling bins and determine how often they will need to be emptied. Vendors: Let your vendors know in advance that they are required to serve food and beverages in recyclable service ware. Specifically request that they do not use styrofoam or plastic #6. Put it in their contract. Exhibitors: Advise exhibitors to break down cardboard boxes and explain the procedure for collecting the boxes (e.g. leave them near their booth for event staff to collect; take them to a designated recycling location). Attendees: Promote yourself as a “green” event. Ask your attendees to recycle. Make stage announcements reminding people to recycle. Event Staff and Volunteers: Assign recycling duties and provide clear instructions on recycling procedures. Let all of your pre-planning pay off and watch the recycling bins fill up! Keep notes about what you see in the trash and recycling bins during your event. This will be helpful when planning for future events. If you see a lot of plastic bottles in the trash, you may need more clear signage on the recycling bins or you may need more recycling bins. If you see styrofoam cups in the trash, you will need to work more closely with your vendors to ensure they serve drinks in recyclable cups. Get tonnage data from your hauler so you can track your progress. Ask vendors to purchase supplies made from recycled materials such as paper towels and napkins. Browse our Buy Recycled Goods database. Find ways to recycle items left over after the event is torn down. Search our Recycling Beyond the Blue Bin database to find organizations that accept your materials or equipment. Develop a plan for composting food waste.